FrostWire: The Best KickAssTorrents (KAT) and Torrentz Alternative! Earlier this month, KickAssTorrents (KAT) website went down and now Torrentz.eu shut down aswell. If you used those sites to search torrents, you may be wondering what alternative site or software you can use. The answer is simple: Get FrostWire! FrostWire allows you to find, download and share files from the distributed peer-to-peer BitTorrent Network – music, movies, apps, ebooks, images. Any file type – no matter how big or small! In addition, FrostWire is also a cloud downloader – fetching results and downloading files from cloud based sources such as YouTube, SoundCloud and Archive.org. You just enter a keyword and search, then pick a file from search results and download the file with one tap. It’s so simple. In only one place you can search and download. Other apps don’t have this amazing feature. FrostWire is available for Windows, Mac, Linux and Android. How to show Search/Transfers in split screen mode on FrostWire? Since FrostWire 6.3.1 you can select how to show the transfers screen: as an individual tab or together below the search results in split view. On this post, you will learn how to use this new option. Open FrostWire and you will see an individual tab for transfers. Click on transfers tab and you will see all transfers! Restart FrostWire and now you will have the search/transfers split screen! What do you prefer? Transfers Tab or Search/Transfer split screen? FrostWire integrates Bitcoin donations and Creative Commons licensing into Torrent files. FrostWire has introduced the possibility for of adding Bitcoin, Litecoin, Dogecoin wallet address into metadata of the torrent file format in order to enable optional donations. By eliminating middlemen and transaction costs, microtipping is now fully possible and the recipients can collect 100% of their contributions. Mainstream centralized digital distribution platforms have been relatively successful at providing big content creators with means of monetization and discovery of their works. In spite of their success however, many self-publishing artists are still struggling with having have to share a significant portion of their revenues with the stores and middlemen, just for being able to bring their works to their fans. The centralized systems also often impose censorship and are ridden with bureaucratic structures that inevitably increase costs, making it impossible for a digital media micro-tipping economy to be born. The FrostWire team believes that by integrating a free, peer-to-peer payment method, Bitcoin, into the free, peer-to-peer file distribution network, BitTorrent, our community can help bootstrap the largest micro-tipping economy of the Internet. By enabling over a quarter of a billion BitTorrent users worldwide to support their favorite content creators with tips of any amount, from a fan directly to the artist, for the first time ever we would enable content creators to collect 100% of their revenues, easily and instantly. This would be the first step towards not only creating an alternative massive monetizable distribution channel, but a decentralized digital media catalog that would make it easier for fans to discover new artists and more beneficial for any content creator to use the power of BitTorrent for a free, uncensored, and direct worldwide distribution. We also believe that the world cannot experience an evolutionary step in digital media distribution if existing copyright licensing is antiquated and not fit for global reach. We want to help speed up the adoption of alternative licensing models by building the tools that make it convenient for content creators to embrace licensing solutions like Creative Commons. Content Creators can now select from any of the available Creative Commons licenses available and express in advanced how their content can be used. As a first step in making this vision a reality, the FrostWire team has developed a way for the payment & licensing information to be included into the .torrent file. Now all BitTorrent Clients and search engines can read that information and present it to their users. The newest version of FrostWire (5.7.1 beta) can already process the payment information. After FrostWire starts downloading a torrent file containing metadata related to a Bitcoin, Litecoin, Dogecoin wallet or PayPal donation url it will show “Tipping” buttons anyone can use to voluntarily support their favorite content creators. 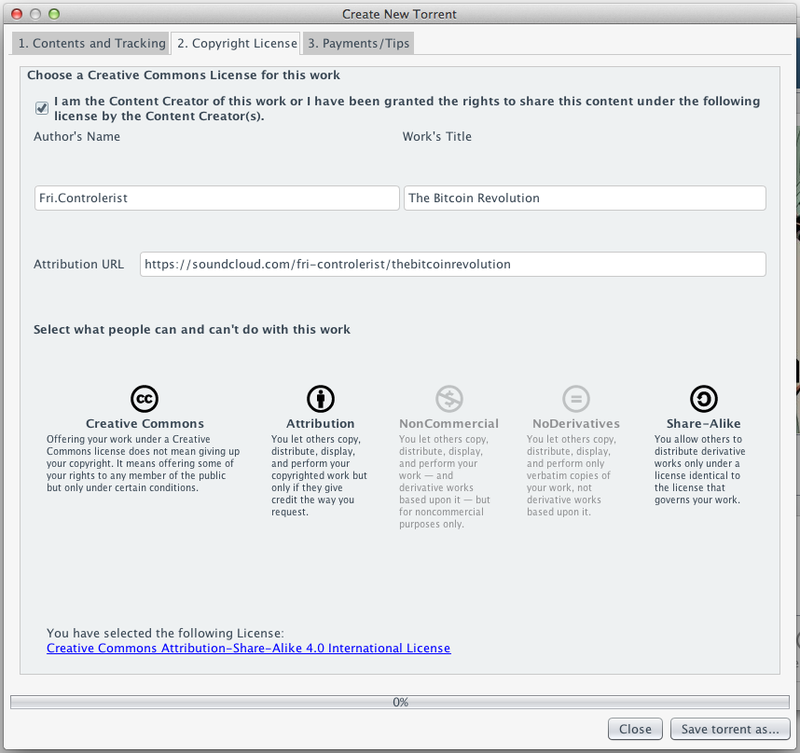 This version of FrostWire already allows for creation of the enhanced torrent, giving the creators an ability to add their Creative Commons License information into the torrent itself. When tipping options are available these appear bolded, and one click takes them to the payment page. Just imagine a BitTorrent bundle in which Bono from U2 shares free songs or a free video documentary to raise awareness and collects Bitcoin donations for the (Red) foundation to further the fight against HIV worldwide. We can’t wait to see all the imaginative use cases this integration can inspire! If you are or know an artists how would like to create their own Bitcoin empowered torrent, please have them contact us at contact@frostclick.com. Before we roll out this particular feature to the general audience, we would like to test to make sure it’s absolutely perfect and bug free. We encourage to try it out yourself and tell us what you think. We have created beta installers for different operating systems so that you can test the tipping/payment process yourselves. This is how the tipping page looks like. It presents the cryptocurrency wallet of your choosing in QR, Text and Link forms. Content Creators are now able to enter Bitcoin, Litecoin, Dogecoin wallet addresses. If they are already using Paypal buttons to collect tips they can also enter the Paypal url. If you want to spread the word about this integration, feel free to use the text and all images in your articles. Everything in this blog is under a Creative Commons Attribution 4.0 International License. FrostWire logos are here.